TINTED 6TH PLATE, FULL CASE. CASE IS SPLIT AT SPINE. IMAGE AND CASE SHOW WEAR. This item is a guaranteed authentic photo as shown from the original time period. NOT a copy , an ORIGINAL OLD PHOTO. PLEASE REQUEST AN INVOICE BEFORE PAYING. "AS IS" items are not returnable unless they do not match the item description. "AS IS" items are NOT warranted to be operational or functional. We do not mark merchandise values below value or mark items as "gifts" - US and International government regulations prohibit such behavior. 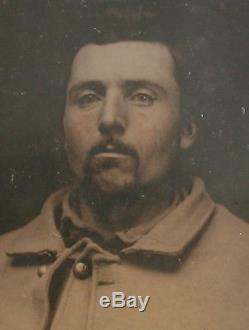 The item "CIVIL WAR AMBROTYPE. TINTED 6TH PLATE, FULL CASE" is in sale since Thursday, April 5, 2018. This item is in the category "Collectibles\Photographic Images\Vintage & Antique (Pre-1940)\Ambrotypes". The seller is "fineartvintagephotography" and is located in Pittsburgh, Pennsylvania. This item can be shipped worldwide.